City Mayor Darlene Magnolia R. Antonino-Custodio graced the Maritime Security Search and Rescue - Marine Pollution Control Exercises conducted by by the South Eastern Mindanao District of the Philippine Coast Guard on March 17. 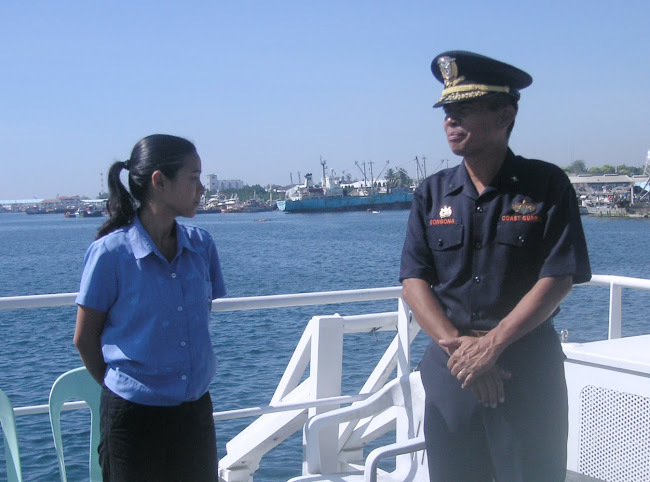 This activity was aimed at effectively protecting the environment and people, and as mandated by Republic Act 9993, the Coast Guard is tasked to implement Maritime Safety, Maritime Security, Marine Environment Protection and Search and Rescue functions, said Commodore Eduardo Gongona, the Coast Guard commander for South Eastern Mindanao District. Gongona and Custodio witnessed the exercise aboard a Coast Guard search and rescue vessel SARV-3501 which was prepositioned at the Makar port. Custodio lauded the Philippine Coast Guard for taking part in the campaign to protect the aquatic and eco-tourism resources of the city and its neighboring areas.